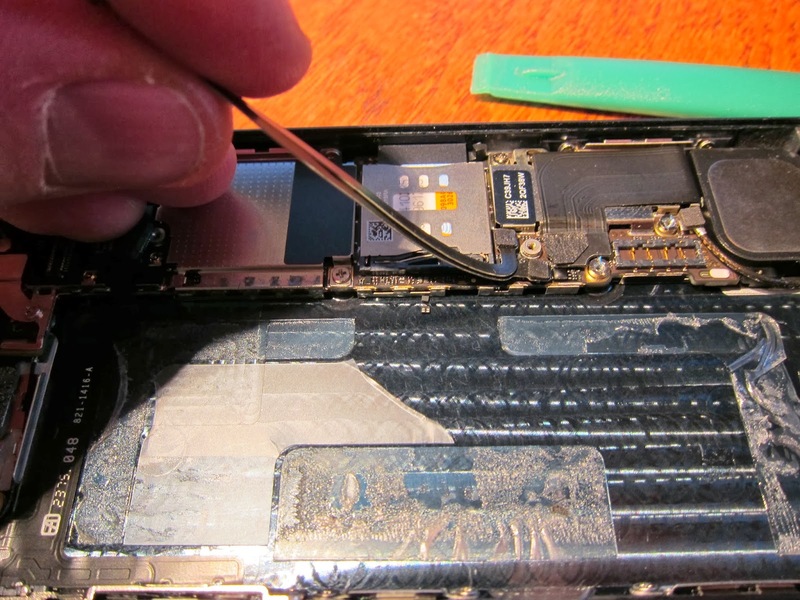 Important things you need to know when replacing an iPhone 5 battery yourself! I have replaced probably a dozen batteries or failed buzzers or other things in my own and my friends and families iPhones up until this. I’ve had exactly 1 problem in all that time where on my daughters iPhone 4 the whole surface mount battery connector came off the board instead of disconnecting. i was able to repair that with the hot air rework station. To remove this battery the videos warn that the tape they used is very strong and suggest gently prying around the battery with the spudger. That was an understatement for mine, the tape was cement. And removing the battery without deforming it was impossible as you can see. This is what the battery looked like when I finally got it to come loose. but it didn’t catch fire or anything. 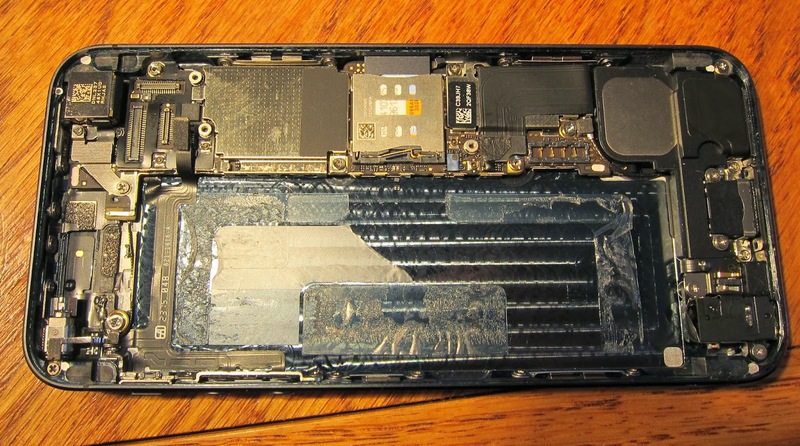 I wish it had occurred to me to use a hair dryer to warm the back of the phone to loosen the adhesive. So thats the first thing I would recommend. Warm it up, not directly on the battery but the back side of the phone. There are some flat cables that run along the side of the motherboard past the sim card cage. This is where the danger is. The look solid, but if you stick the spudger down there to get under the battery you will damage the motherboard underneath them. You can see in this picture that there isn’t even any adhesive in this area, possibly for the exact reason that you can’t pry here. But nobody says not to pry here. After removing those flat cables it becomes obvious what happened, you can even see the 2 pin head chips that I broke lying on the back of the case. Yes, I managed to break off 2 of them prying the battery out. I stared at them for some time, even going so far as cleaning the area with some flux and the hotair rework tool but that chip there is obviously damaged, the pads broke off in the chip while 4 others let loose. Wonder why they came off so easily? I am not by any means the only person to have this problem there are many reports on the internet. 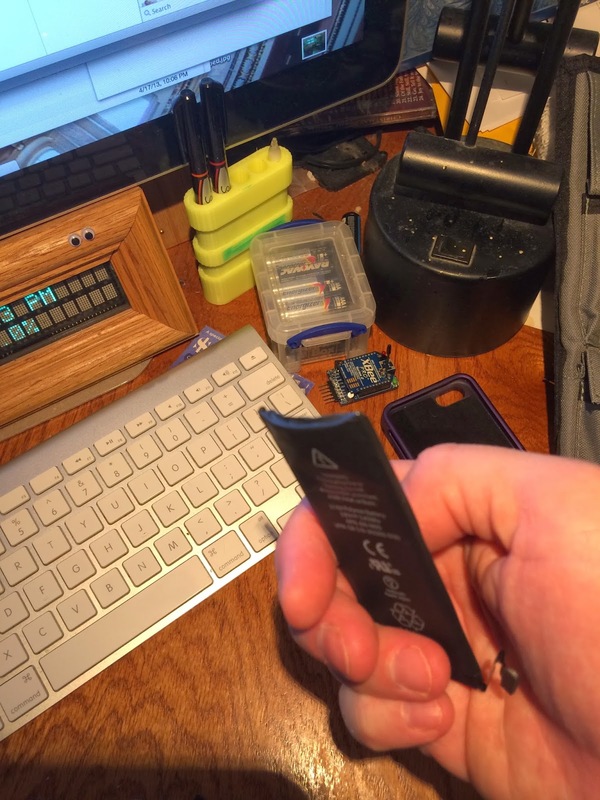 I still think it’s possible to replace these batteries yourself, but take your time, heat up the sticky tape and DO NOT PRY across from the sim card slot! 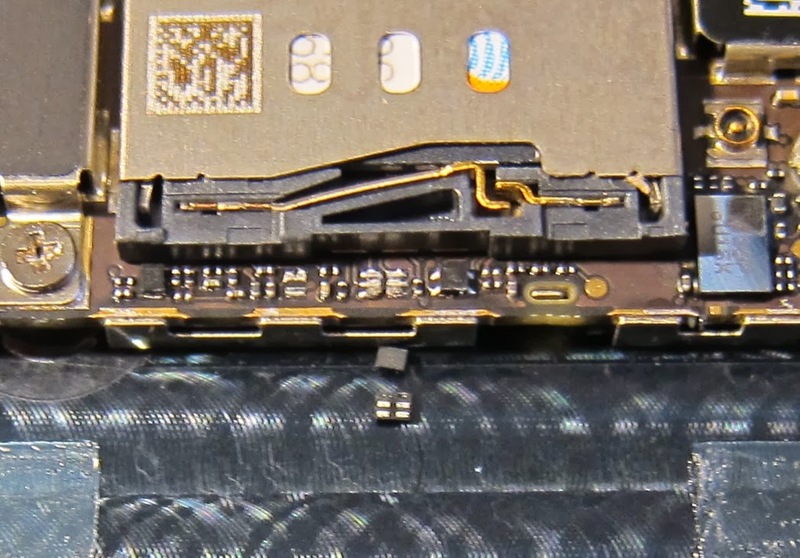 the sim card slot is right in the middle where there is no tape on the motherboard side. Now off to ebay the screen and other still useful parts to try to take some of the edge off the pain of having been an impatient idiot tearing into this poor phone. 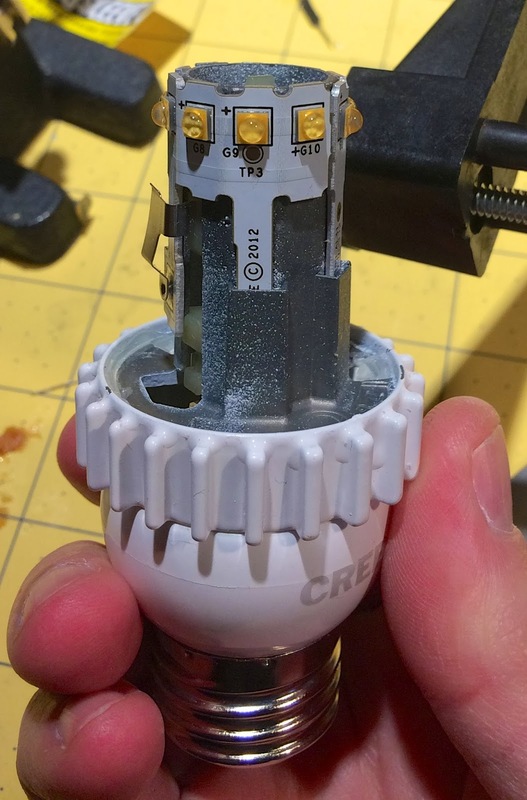 Silencing a Buzzy Cree LED bulb. The $12 Cree branded bulbs that HD sells are great. They are bright, have good color, they dim and turn on and off reliably with old style pushbutton X10 dimmers but when they are on an old dimmer they buzz something fierce. When on a new style dimmer they are much quieter but I bought some especially to put on X10 dimmers. is what I filled the base with to shut the noisy thing up with. And boy is it quiet now. 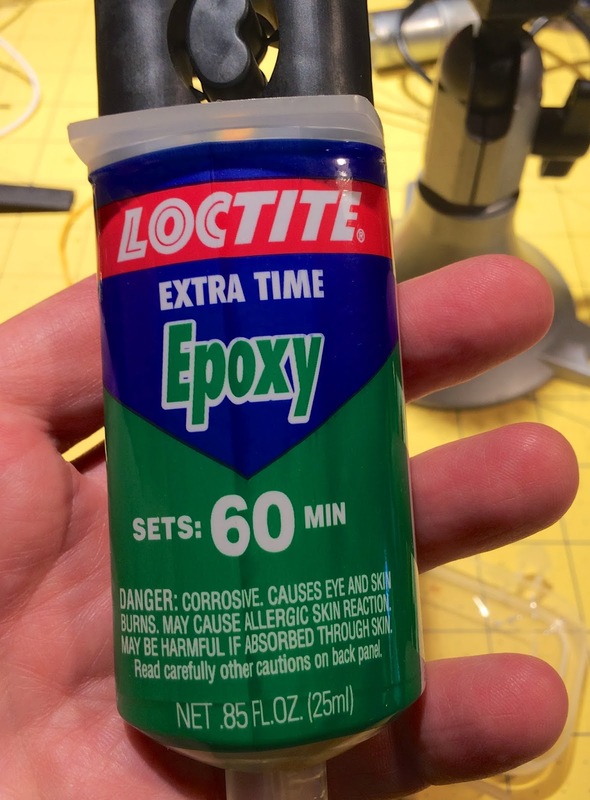 I dont know what that will do to thermal issues in the power supply, but I just mixed that entire tube and poured it down the top of the bulb letting it coat all the electronics. Once setup it’s as silent as I could wish for. It really shouldn’t be necessary to break the bulb off one to do this, you could drill a small hole in the metal base, there is room in there probably to do so without hitting anything if you were careful. Probably, but dont try it unless you can see what you’re doing and wish to ruin a lightbulb in a spectacular and potentially dangerous way. And then you could fill it with proper non-conductive thermally conductive potting compound to do the same which would probably then increase the life of the bulb... If it dies a horrible death sooner rather than later I’ll be sure to write it up.